As many of you know, if you read the blog, we love Candy Club in our house. My kids are huge fans of Candy Club and get so excite every time we have a box come in the mail. They always have the best candy to choose from, it’s super fresh and tastes amazing every single time. With Easter coming up of course it was my go to source for finding some candies to fill Easter baskets and plastic Easter eggs. Candy Club is an amazing box subscriptions service that delivers fresh delicious candy to your door step every single month. It really couldn’t be easier. 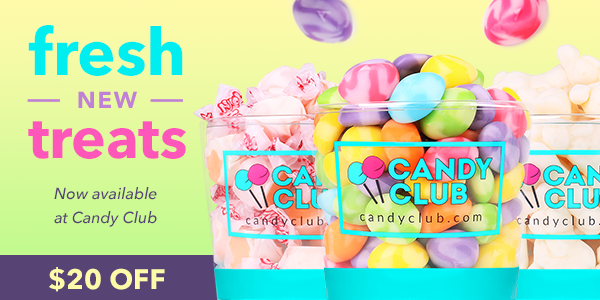 Simply log into the Candy Club site and sign up for a subscription. You will take the candy quiz so they can curate a box for you, they are really good at picking candies for us. However, if you don’t like a selection you can go in and choose your candies to get the perfect box. The box is shipped straight to your door step every month. They even have some special edition candies for special events and holidays. My kiddos love picking out their favorites every month. With Easter coming up I wanted to choose some things that were bright and spring inspired. I plan to put a few containers in their baskets and use the individually wrapped candies to fill up some plastic eggs for them to hunt around the yard. Super easy, I don’t have to fight the crowds at the store and they really enjoy the candy. They have a great selection of candies to choose from every month. We like to try something new with each candy box we get. It’s a lot of fun exploring new candies and we have not found a candy we didn’t like yet. You can find out more on the Candy Club website. Currently you can get $20 off your order.